If you are looking for a 5 days in Jordan itinerary, you are in the right place. I have visited Jordan multiple times since 2016 and have made many mistakes when putting together what to do in what order. 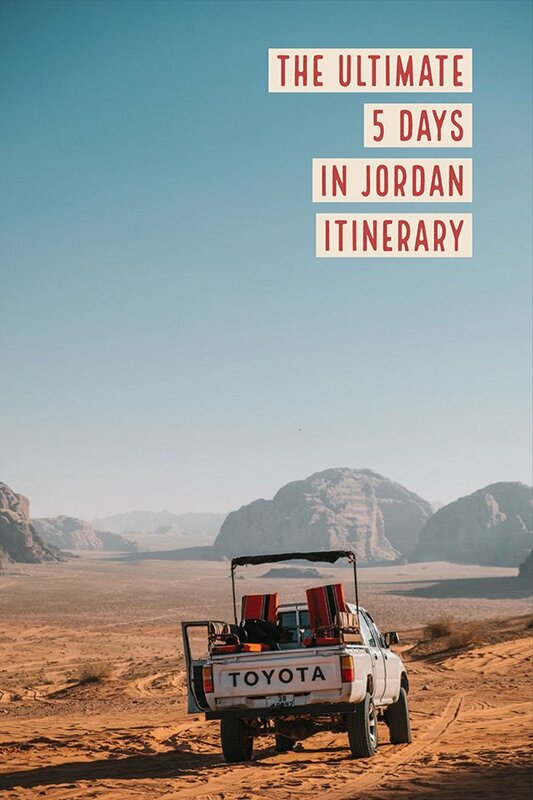 If you want to get the most out of your 5 days, I suggest you follow this 5 days in Jordan itinerary to save yourself some headaches. I am going to make a few assumptions about your 5 days in Jordan. If these do not apply to you, I will offer alternates at the end of this Jordan itinerary post. For example, I am assuming you are arriving and departing from AMM (Queen Alia International Airport). But if you are not, that is fine, if you are departing to Israel by land after your visit, I will suggest how you get to the border to cross). In this Jordan 5 day tour, I am also making the assumption that you will be self driving the country, or do not have any prior tours booked. If you do not plan on driving, that is ok, I will also advise on public transport or private car hire options to get yourself through this itinerary. I have plenty of information on driving in Jordan here. So lets get into it, how to plan the best 5 days in Jordan itinerary to hit all of the major attractions of Petra, Wadi Rum, Jerash and Amman! Wadi Rum is a must-see and I recommend it to everyone visiting. There is an overnight in Wadi Rum on my 5 days in Jordan itinerary. This is one of the natural rock bridges that you can see on a 3 hour jeep tour. Stop 5: Finish off your first day of your 5 Days in Jordan Itinerary with Dinner at Hashem Restaurant. Where to Stay on Day 3 of your 5 Days in Jordan. What to Pack for Jordan for any season. Your arrival into Queen Alia International Airport will be the start of your 5 days in Jordan. Providing you are planning to self drive, this is a great place to pick up your rental car. I have to admit that I am going to make another assumption here, you are arriving late and going to your hotel to sleep. That is why I have called this Day 0. If you have a morning or midmorning arrival, you can go right to Day 1. I really hate it when tour companies offer you a 7 day tour, but really the first day and the last day are arriving and leaving, so you only get 5 days out of it. That is why I am calling this day 0. If you are arriving by land from Israel, you probably crossed at the northern border and will make your way to Amman on day 0. 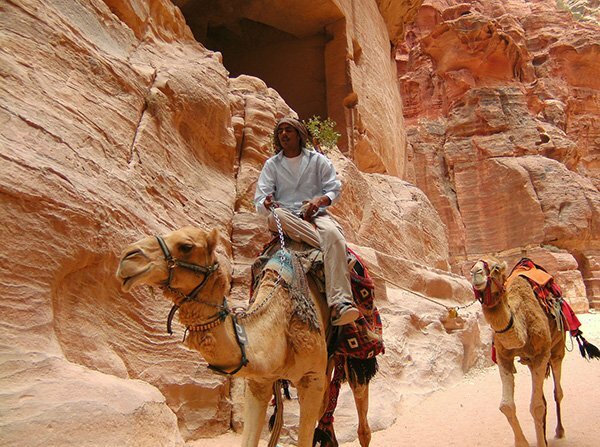 After breakfast at your hotel, your official Jordan 5 day tour is about to start! 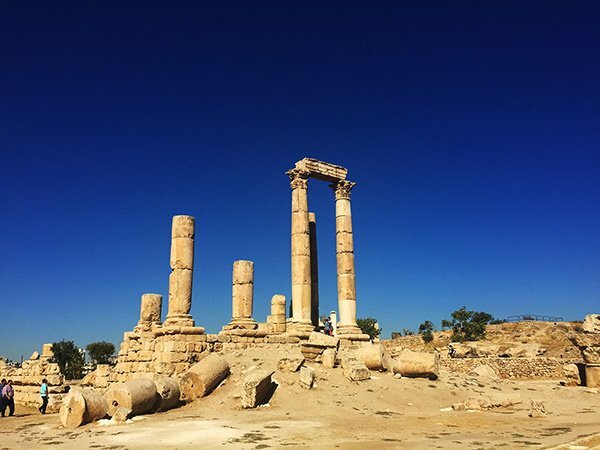 Today you are going to visit the Jerash, the best preserved Roman ruins outside of Rome, the Citadel at Jebel Al Qaia, the Roman Theatre in Amman, enjoy local eats at Hashem Restaurant or the Windmills restaurant and get a glimpse of the downtown core of Amman. About 1 hour’s drive north of Amman is Jerash, the best preserved Roman ruins outside of Rome. The site is massive, for anyone who has explore Ephesus or other Roman ruins, this site blows them all out of the water! From colonnaded streets to theatres to the massive Hadrian’s Gate, it can take a couple of hours to have a quick walk through the site. It was only in recent years that the beautiful oval was discovered. Soldiers were camping on the site, and after hitting hard ground, they began excavating, and what was discovered was the massive oval. Much of Jerash’s preservation is due to mud covering much of the site. There are still excavations going on, although most of the major structures have been found. What has not been uncovered is where the homes were of those who lived here. Depending on time, you can have lunch outside of the site. If you are not yet hungry, continue to stop 2. 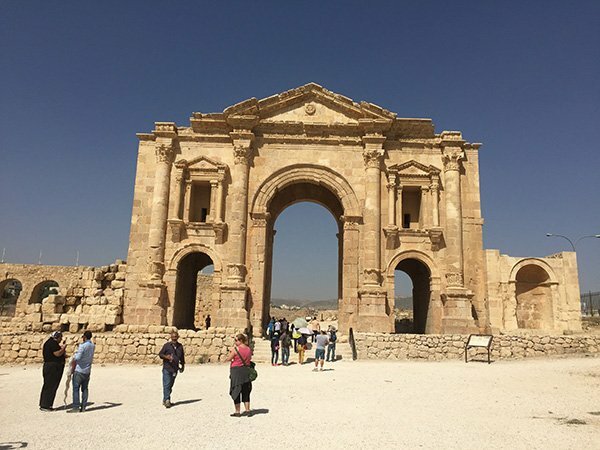 Hadrian’s Gate in Jerash is the first stop on your 5 days in Jordan itinerary. This triple arch structure was erected in 126AD to commemorate Emperor Hadrian’s visit to Jerash. Almost fully restored to its former glory, it is the first of many amazing features that you will see in Jerash. I really enjoyed Umm Qais so if you have time I suggest you visit. It offers stunning views of Northern Jordan, the Sea of Galilee and the Golan Heights into Syria. Many of the preserved columns are mostly made of black stone. The site is much smaller than Jerash and only needs 30 minutes or so. As mentioned, you will see the massive remains of the Hercules temple, built during the reign of Marcus Aurelius in the second century AD, and the fist of Hercules, the only remaining piece of the estimated 13 meter statue erected at the site, its shattered pieces long since pillaged. From the top of the hill, you can see the the Roman Theatre in downtown Amman, cut into the side of a mountain. There is also a Byzantine church, an Umayyad palace and the Jordanian Archaeological museum. The Amman Citadel offers some amazing angles for Instagram photos. You can also check out some other Top Instagram places in Jordan when you are finished with the itinerary. You can plan to spend about an hour at the Citadel as you climb to the top and take time to take photos, wander the museum and walk through the church and palace remains. If you move quickly, you could do it in 30 minutes. While at Jebel Al-Qaia, you will see the impressive theatre, built almost 2000 years ago and right into the side of a mountain. Climb to the top if you are not afraid of heights and you will have an amazing view of the theatre below, and of the whitewashed buildings that cover the hills of Amman. depending on the time, you can walk down the steps to the theatre, but you will have to get your car at some point. There is not much parking outside the theatre. Downtown Amman is problematic for parking most of the time. Hashem Restaurant is the most well known restaurant in Jordan and has been doing business for over 80 years. Despite its appearance it attracts celebrities and even the King, who has been known to dine next to locals and tourists alike! It is a must try for any foodie who is visiting Amman! Although basic in appearance, this 24 hour vegetarian restaurant serves up excellent falafel and hummus and I guarantee you will leave with a full stomach! It does have indoor seating, but literally wedged between two buildings, most of the patrons spill into the patio and enjoy their meal outdoors. If you arrive right at dinner time, expect it to be busy. A meal at Hashem for two people will cost about 4 JD – 10 JD. Alternate Dinner Suggestion in Amman: If you are more interested in fine dining, visit Tawaheen Al-Hawa (in English it is translated to the Windmill restaurant). It has a set menu with beautifully plated appetizers and mixed grille main dish. After dinner, consider a walk around the downtown area, or find a coffee shop and enjoy a Turkish coffee. Since you have a vehicle, there are plenty of options for somewhere to spend the first night of your 5 days in Jordan Itinerary. Tomorrow will have a lot of driving. After breakfast at the hotel, today you will visit Mount Nebo, Madaba, the Dead Sea and finish your day arriving into Wadi Musa, the town outside of the Red Rose City of Petra. 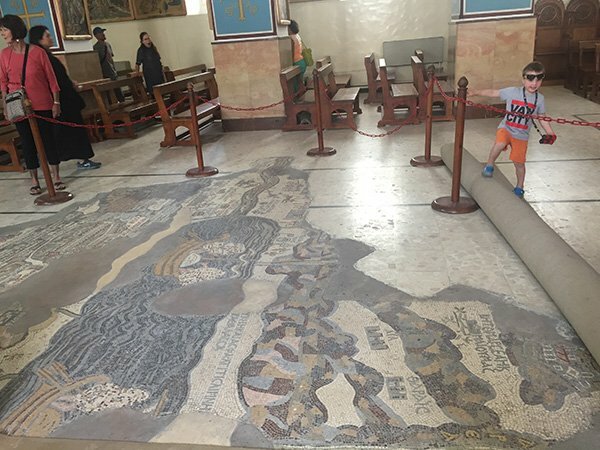 The Highlight in Madaba is Saint George Church where you can see the mosaic map of the holy land, dating back to the 6th century AD. The mosaic map is made up of 1.2 million pieces of natural colored stone and pictures a rendition of the Holy Land. 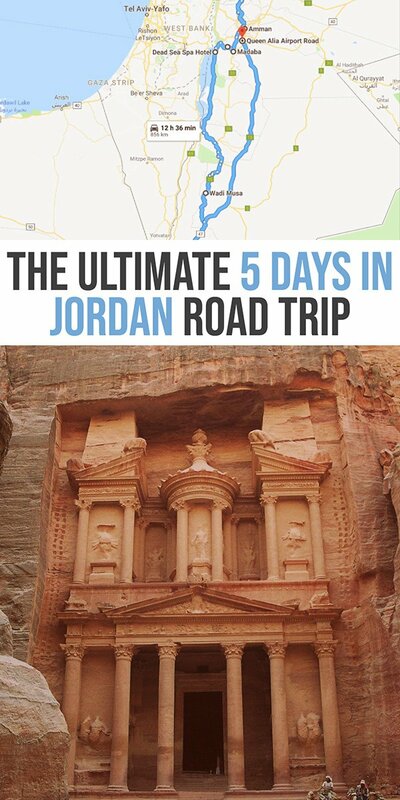 This stop on your 5 days in Jordan Itinerary will take an hour or less. If you are looking for a great viewpoint in Madaba, consider climbing the tower of the Church of the Beheading of St. John the Baptist. It offers stunning views of the city and beyond. Interestingly, it is also located atop an ancient castle where you can see remnants of the 3000 year old walls. 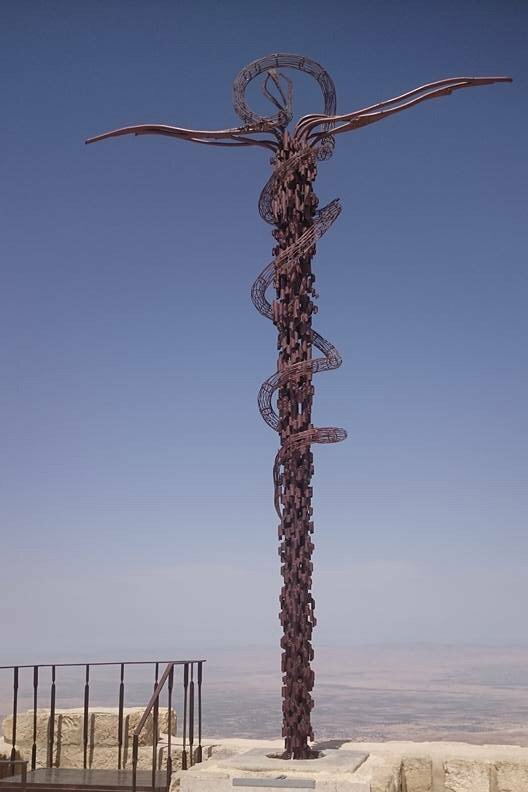 Mount Nebo is known as the spot where Moses pointed to the Promised Land after wandering the Jordanian Desert for 40 years after leaving Egypt. The Franciscan Monks, who own the land, were the ones who excavated (with the help of the local community) and discovered the remnants of churches on the mountain and in the surrounding area. Today, Moses Church stands atop the mountain. Opened in 2017 it houses mosaics dating back to the 4th century AD. In the year 2000, Pope John Paul II visited the site and declared it an official biblical site. Expect to spend about 30 minutes to an hour here. 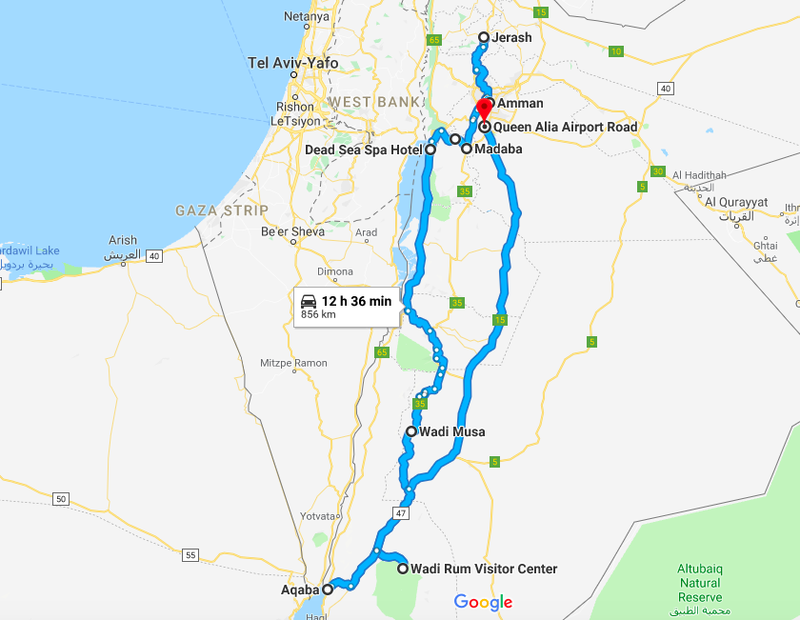 It takes 30 to 45 minutes to drive from Mount Nebo to the Dead Sea. You will feel a temperature increase as you drive lower and lower to the lowest point on Earth. There are a few options to float at the Dead Sea. You can go to Amman Beach, a private beach club with swimming pools, changing rooms and showers and access to float on the Dead Sea. You can also pay a day rate to use a Hotel’s Beach Access. The Dead Sea Spa is one of these options. FURTHER READING: Things to know before visiting the Dead Sea. More about driving to the Dead Sea from Amman. Coat yourself in some mineral rich mud and then go for a float at the lowest point on earth. Definitely a highlight on any Jordan Itinerary. 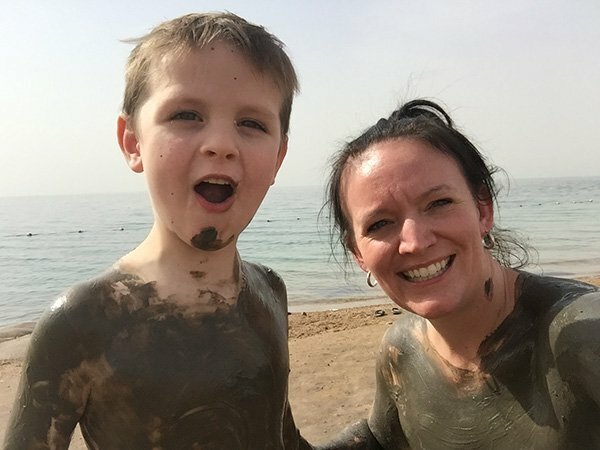 I suggest you do not put mud above your eyes as rinsing it off in the Dead Sea leads to plenty of stinging! After the Dead Sea, you have about a 4 hour drive to Petra. Plan accordingly. If you leave mid afternoon, most of your driving will be in the light and you can better see the scenery around you. Luxury: Movenpick Petra (right outside visitors center, with a pool, you can read my full review here. It is nice to book half board so you can have dinner after your day in Petra), Marriott Petra (driving distance with a pool that is open late) with beautiful views of the site below. Petra opens early, so today after breakfast you will visit the site. If it is a Monday, Wednesday or Thursday you can opt to visit Petra by Night in the evening. You can also visit a local family or learn the basics of Jordanian diet with a cooking class. Everything about day 3 on your 5 day Jordan itinerary is below! 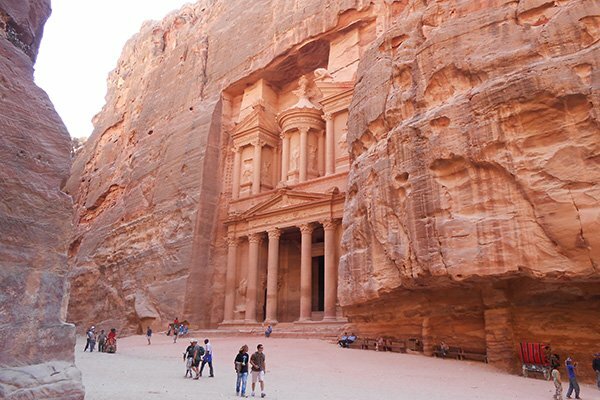 Petra takes a big chunk of your 5 days in Jordan Itinerary, but for good reason. The amazing carvings of the Nabataens are a tick off the bucketlist! Petra is open from 6am to 6pm in the summer and 6am to 4pm in the winter. As with any popular tourist site, the earlier you arrive, the less people that will be there. Petra received almost a million visitors last year, but it is not crawling with people. The site is so enormous that people spread out over the 60 square kilometers, some coming just for a glimpse of the Treasury and others exploring on a multi day visit. At the visitors center, you can see a map of the site. It starts with a downhill walk towards the Siq. Here you can take an optional horse ride. The price of the ride is free, but you are expected to tip the owner of the horse. Before you ride, negotiate the tip. 3-5 JD is reasonable. Note that you only ride about 600m to the entrance of the Siq. You can also ride back up the 600m at the end of your day. The Siq is a naturally formed canyon, created by an earthquake. Its walls are up to 60m tall and some places are just wide enough for a horse and cart. Along the narrow gorge you will see ancient carvings, remnants of ancient waterways and plenty of beautiful formations. after the 1.2 kilometer stretch, you will emerge at one of the most impressive sites, the Treasury. Likley the most famous site in Jordan, the Treasury was actually used as a tomb. Features in Movies such as Indiana Jones, it has gained notoriety around the world, and is the most visited site in Jordan. 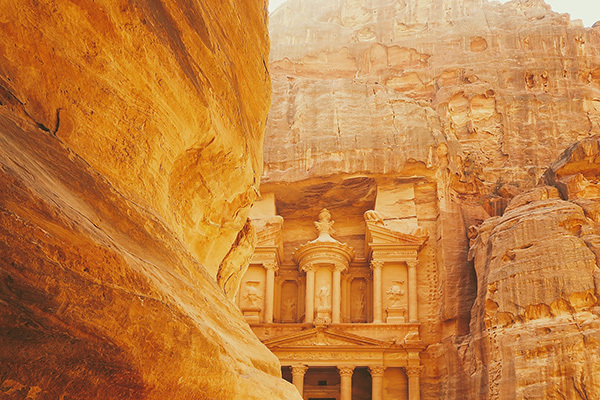 While plenty linger here, there is much more to explore in Petra. After time for photos, continue down the lower siq. This is a decent spot to use the toilet. They are outhouse style, but cleaned regularly. It is customary to tip the attendant who is there. Petra is one of the worst places for toilets, but this one has always been decent for me. As you continue downhill from the Treasury you will come to the Street of Facades, the Amphitheatre, the Nymphaeum and the Colonnaded Streets. There are photo ops everywhere! If you want to see the Treasury from above, you can go to the Al-Khubtha trail. The hike to the Monastery is 2.5 km round trip (1.6 miles) from the end of the main Petra trail. Note that you have already walked 4 km to get here! Bring lots of water! There are hundreds of steps and moderate uphill sections. But the end result is the stunning Monastery. This trail is 3.5 km return (2.2 miles) and has some moderate elevation gain (although a lot is stairs). I did it with a 4 and 6 year old, but it was hot and sunny and we took lots of breaks. It is worth buying a drink from the cafe at the top and taking some time to take some epic photos of the Treasury. Note that there are no DANGER or WARNING signs around. This puts some people off, but I feel as though the North American mentality is that sites are so afraid to get sued that they need to put these danger signs up. Just use some common sense and you will be fine. I never feared that my 4 year old was going to run off the side of a cliff. Even kids have a sense of safety. But do not go for the precarious selfie photos. Ensure you are safe before taking any photos! If you want to try your hands and some basic cooking and learning about the local ingredients used in the daily lives of Jordanians, you can visit Petra Kitchen. They have classes every night at 6:30pm. A Piece of Jordan offers visitors to Jordan the opportunity to meet with a local family in Wadi Musa and enjoy a cooked meal with the family. READ MORE: Is Petra by Night Worth It? What you should know before you go. You are spending the night in Petra again. So you can stay at the same hotel as the previous night. Again here are my suggestions. If you have any questions about these places, feel free to ask, I have stayed in or visited all of them. Luxury: Movenpick Petra (right outside visitors center, with a pool, you can read my full review here), Marriott Petra (driving distance with a pool) with beautiful views of the site below. Enjoy breakfast at your hotel this morning. Then you will have the opportunity for a Petra 1/2 day visit and/or Little Petra, drive to Wadi Rum for 2 hour sunset Jeep tour, optional camel rides and traditional Bedouin dinner and overnight in Wadi Rum traditional camp. If you are interested in one of the hikes from day one, Petra opens at 6am and you can get an early start and finish by lunch! Petra is somewhere that can be explored in multiple days, so after Day 1, if you are keen for more, head on back to the site. 15 minutes from the visitors center is Little Petra. It will only take an hour to walk through, but it is worth visiting to see the fresco painting that survives inside one of the caves. There is also an ancient village that dates back to 10 000 years ago that is a short walk from the parking lot. The bedouin tea near the “best view in the world” is amazing as well! After Little Petra, you are going to drive to Wadi Rum. It is about an hour drive, and you want to ensure you either BYOB or are happy with tea and pop and water. You can also bring some of your own snacks. I usually bring a bottle of wine and drink it from a coffee cup and a few snacks from a store before you turn down the road to the Wadi Rum visitors center. After arriving at the visitors center, you can book a Jeep Tour. This is one of my favorite things to do in Jordan. If you want to visit the rock bridge in my very first photo on this page, you need a 3 hour tour! You can also ride camels into the sunset in Wadi Rum. A cool experience for sure! 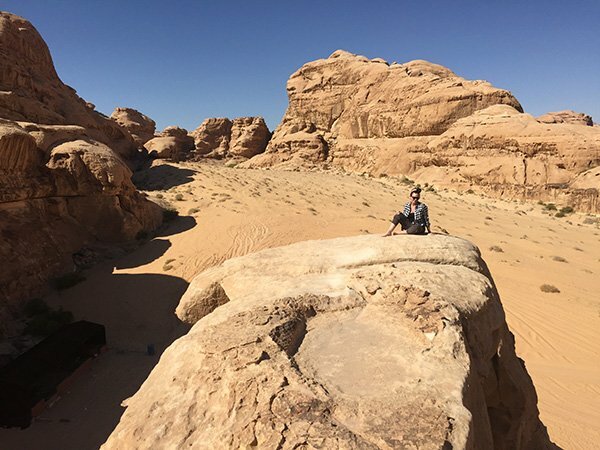 READ MORE: Want to know what to expect when camping in Wadi Rum? Check out this guide to Wadi Rum Camps. There are dozens of desert camps in Wadi Rum. Many are used by tour groups, others by locals and plenty with good reviews online. I have stayed in a local oriented camp, a luxury camp and your typical tourist camp. I like them all for different reasons. Today you will have breakfast in Wadi Rum and then drive to Aqaba to Snorkel on the Red Sea. In the afternoon you will return to Amman for overnight or your evening flight home. If diving or snorkeling is your thing, do not miss the chance to do it on the Red Sea. It is about an hour’s drive to Aqaba where there are daily snorkelling trips out to the reefs. After lunch, you will be heading back to Amman for your trip home (or to overnight). If you are not interested in seeing the Red Sea, drive back north and stop at Karak Castle (one of the Crusader Castles) on your way back to Amman. Most flights leave in the evening. You could also overnight in Amman and fly out the same day. Or if you are crossing by land to Israel, return your rental car, overnight in Amman and arrange transportation to the Allenby Crossing / King Hussein Bridge. An overnight at the Dead Sea would put you quite close to the crossing as well. If you are a visual person and want to see where you 5 days in Jordan will take you, I have created this handy map so you can see how you will traverse the country. Jordan has high and low seasons, with popular times to visit being March until May and Sept to Nov. Christmas break is also popular. While I often visit right in the middle of tourist season, it does not seem overcrowded and you can almost always find somewhere to stay. But if you are particular on accommodations, book in advance. You will also find car rentals are a bit more expensive. Jordan experiences 4 seasons, with spring being quite wet. Flash floods can occur from Feb to April resulting in closures at Petra and flooding of roads. These are usually quite quickly over, but if you are visiting in the spring, you could have 5 days of sun, or rain and even snow in higher elevations. Summers are extremely hot with fall enjoying quite high temperatures as well. December to March can be quite cold, you need winter gear for sure. I personally suggest staying away from Ramadan as shops can be closed, hours of the sites vary and I feel as you get less of the country, as the muslim population is fasting during the day (and not always working). Ramadan does offer cheaper prices for budget travelers. If you are visiting in late spring, summer or fall, you are going to be warm. If you are visiting in late fall to spring, you are going to need winter gear. Jordan is very mountainous and has for bio-graphical climates. Your wardrobe needs to match the season. When I say I pack a down jacket for March and April, I mean it! Jordan is a conservative muslim country. I dont suggest women should wear shorts, tank tops or any low cut clothing. You will see plenty of tourists doing it, but I do not consider them to be respectful travelers. I have a what to pack for Jordan guide here. I am constantly asked if Jordan is safe. It’s neighbours have ongoing conflicts, but these do not spill over the borders. I feel completely safe traveling as a women with two kids in the Middle East and fell in love with the hospitality of the Jordanian people. 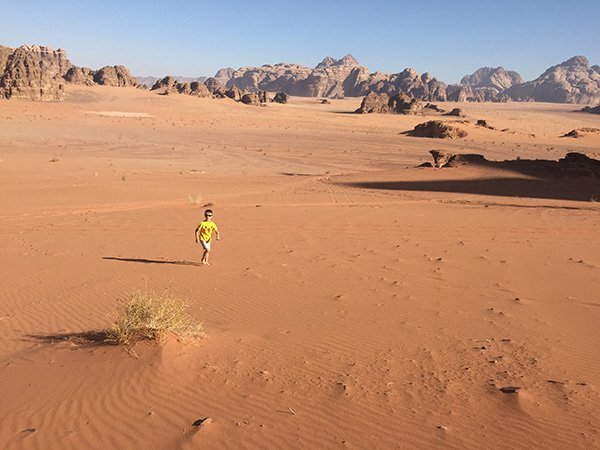 You can read more about my experiences on safety in Jordan in 2019 here. Wondering what to expect at the Dead Sea? Read this post Dos and Donts at the Dead Sea. Do you have more time in Amman or decide to spend another night? Check out what to do in Amman. Want to bring home something special? Check out the best souvenirs from Jordan. Are you heading to Jordan soon? Do you have a 5 day Jordan Itinerary planned? Do you have questions? Did I miss something? I would love to know what you are most looking forward to! Let me know in the comments! A very well-done and interesting post about Jordan. I will put this on my list of places to visit. This is definitely an ULTIMATE trip as it covers so many fascinating places. 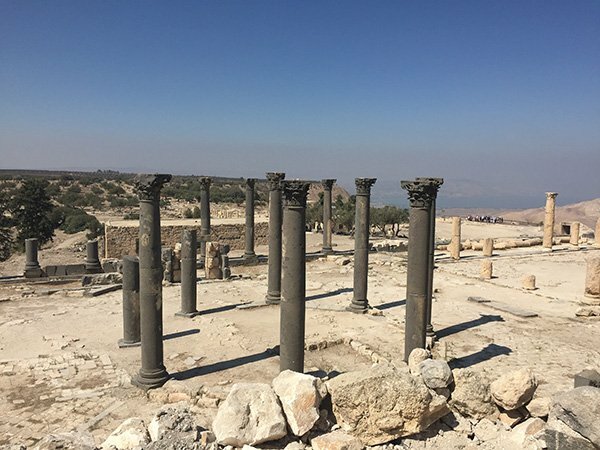 I’m intrigued by the views and the black stone pillars at Umm Qais; I’d love to swim in the Dead Sea and see the Moses Church on Mt Nebo. And Petra?! So amazing! Jordan was the first country I visited outside Europe back in 2000. Still, there are a few places I’d like to visit again, so I must go back sometime. In fact, I never went to Wadi Rum, so I really must go back!